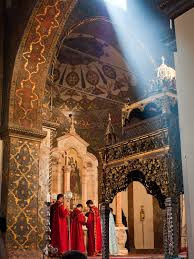 Armenians love to go to the church on Sundays. This is a sacred day, when after six days of work people spend time in relation with God. They separate themselves of all problems and personal relationships, set aside future plans, tasks, to do-s, and in the church, under the deeply touching holy hymns emerge into the presence of our Lord. In the inner silence they recall what have they done that wasn't glorifying the Lord, think of the days, when in the hassle of the life they had misbehaved, made mistakes, didn't do what would have been good for everyone, had been selfish, inconsiderate, greedy, and many other things. In this video they are well-known people, you will recognize. If you know them, leave your comment in our blog. If you are in Armenia, you should also join the army and believers and let Jesus give you new life. May you be blessed by the Lord Jesus Christ.